The first funerals have been held for those who died in last week's avalanche at a hotel in central Italy. 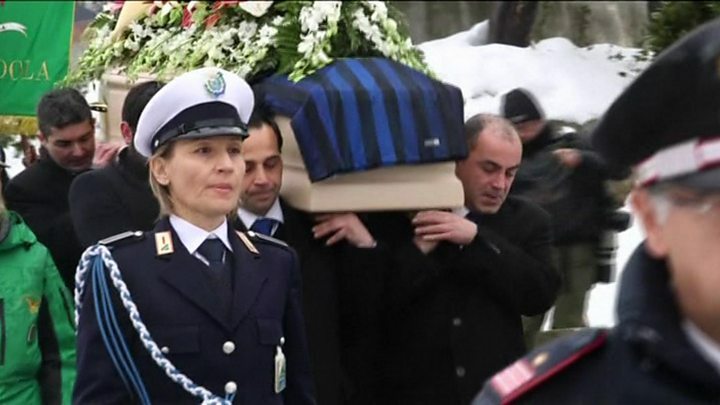 Crowds paid their respects to Alessandro Giancaterino, 42, and Gabriele D'Angelo, 31, waiters at the Hotel Rigopiano. Another body, of a woman, was found on Tuesday, bringing the death toll to 16. But rescuers continue to search for 13 people still missing, and say there is a chance survivors could be trapped in the hotel bar. They are trying to punch their way in through the 80cm (2ft 7in) concrete wall, in the hope that some could still be alive in air pockets there. "We are working on the theory that the avalanche did not necessarily hit or destroy every room and that we haven't yet reached the heart of the structure," said a spokesman for the fire service, Luca Cari. He said rescuers were working around the clock at the remains of the hotel - which in 2009 hosted Hollywood star George Clooney. 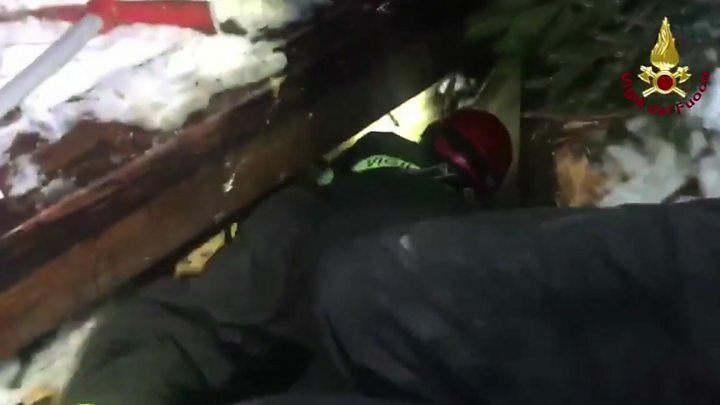 So far, 11 people have been found alive following the 120,000-ton avalanche - which police have calculated had the equivalent impact of the hotel being hit by 4,000 fully loaded trucks travelling at over 100 km/h (60 mph). On Tuesday, first victims were laid to rest - chief waiter Giancaterino in the next village of Farindola, while fellow waiter D'Angelo was being buried a few kilometres away. Giancaterino was in the hotel at the time as he had offered to stay for a double shift on 18 January to cover a fellow worker who was struggling to get in through the snow drifts, said AP news agency. "He was a great hard worker. He was very professional," said his brother, Massimiliano Giancaterino. "This is the memory that I want to keep of my brother, beyond obviously the private ones that I keep in my heart." At the hotel, rescuers have been able to excavate a path into the hotel which allows access for heavy machinery, said firefighters' spokesman Mr Cari. They will now try to create a shaft through the thick concrete wall dividing the bar from the kitchen, in the hope that there could be an air pocket - and possible survivors - in the space behind. As the search continued, a rescue team was sent from the base co-ordinating the avalanche operation to help in an unrelated helicopter crash nearby, public broadcaster Rai reported. Italian President Sergio Mattarella has called for a "united effort and common front in the face of disaster". But further concerns have been raised about the emergency services' handling of the disaster and authorities have opened an official inquiry into the circumstances of the tragedy. Details have emerged of an emergency phone call between a restaurant owner and a senior official at the local authority co-ordinating rescues in Pescara. A transcript has been published by Italian daily La Repubblica. At 18:20 local time (19:20 GMT), after the hotel's collapse, Quintino Marcello tells the official that his chef, Giampiero Parete, who was staying at the Rigopiano, contacted him on Whatsapp five minutes before. "The Rigopiano hotel has collapsed, there's nothing left. He's there with his wife and little children. Act immediately. Go up there!" But La Repubblica says the official insists the hotel is fine and that the fire brigade checked it out during the morning. It was a barn containing sheep at a farm that had collapsed, the official says. Mr Parete had already contacted emergency services some time before, La Repubblica says, but they checked with the hotel owner, Bruno di Tommaso, who told them he was unaware of an avalanche - though crucially he was not at the scene. Earlier, relatives of the missing complained that the snow-bound hotel should have been evacuated before the avalanche hit late on Wednesday afternoon. One relative, Alessio Feniello, accused authorities of wrongly telling him that his son, Stefano, had been rescued. It has also emerged that the hotel owner sent the authorities an email asking for help a few hours before the avalanche, saying that guests were "terrorised by the earthquakes and have decided to stay out in the open". Prosecutor are also examining whether environmental risks were properly assessed during the construction and subsequent renovation of the hotel.